The Ethiopia Field Station (EFS) is based in Addis Ababa, the capital of Ethiopia, and operates with a substation in South Omo Zone in the Southern Nations, Nationalities, and Peoples Region. Seminars were organized in Addis Ababa and in the South Omo Zone, respectively. In Addis Ababa, on November 7, 2004, ITO Yoshimasa (enrolled in FY2003) presented an interim report on the on-site research and held active discussions with SHIGETA Masayoshi (ASAFAS faculty member), NISHI Makoto (enrolled as a third year student in FY2003), YAMAMOTO Yudai (enrolled in FY2001), SATO Yasuaki (enrolled in FY2001) and KANEKO Morie (enrolled in FY1998). At the substation in South Omo Zone, on November 16, 2004, Belle Asante (enrolled in FY2002) presented an interim report on her on-site research and had active debates with the participants including Dr. Gebre Yntiso (EFS counterpart) and Dr. Mamo Hebo. On November 10-27, SHIGETA Masayoshi, Dr. Gebre Yntiso (EFS counterpart), Dr. Mamo Hebo, ITO Yoshimasa, Bell Asante, YAMAMOTO Yudai, SATO Yasuaki and KANEKO Morie conducted a study tour mainly of Southern Ethiopia. During the tour, the participants deepened their knowledge of cultivation and processing of enset, the staple food of Southern Ethiopia, traditional basket-making techniques, pottery, ironware, etc., the cultivation method and distribution process of coffee and chat, the local cash crops, and discussed the possibility of making area comparisons. 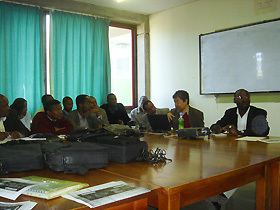 Lecture at Addis Ababa University: SHIGETA Masayoshi conducts a seminar for graduate students majoring in cultural anthropology at the College of Social Science of Addis Ababa University (November 27, 2004). Substation: A field seminar is conducted in the seminar room of the substation established in South Omo (November 16, 2004). Belle Asante presents an interim report on her fieldwork. Making botanical specimens: SATO Yasuaki and ITO Yoshimasa make botanical specimens and organize ethno botany materials. South Omo sub-station. A joint research project was carried out on language education in South Omo Zone headed by Dr.Baye Imam, former Director of Institute of Ethiopian Studies of Addis Ababa University. Dr. Imam stayed in Japan for three months from July 2004 as an ASAFAS visiting professor. "Area Studies on the Environmental Preservation Functions of African-style Livelihood Systems," a joint research subsidized by Grant-in-Aid for Scientific Research, was carried out in cooperation with the faculty members and graduate students of the Department of Sociology and Social Anthropology, College of Social Science, Addis Ababa University. 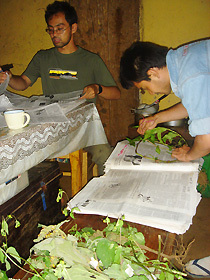 SHIGETA Masayoshi, during a study tour (November 10 - 27, 2004), was given an interim report of the on-site research conducted by Mr. Mitik Dizi who is now studying at the Zway, and engaged in a vigorous discussion on the environmental preservation functions of the traditional agricultural system in Southwestern Ethiopia. SHIGETA Masayoshi, in a lecture he gave on November 28, 2004, to graduate students of the Department of Sociology and Social Anthropology, College of Social Science, Addis Ababa University, presented an interim report titled "Area Study on the Environmental Preservation Functions of African-style Livelihood Systems," a research subsidized by Grant-in-Aid for Scientific Research, and conducted lively discussion with Dr. Gebre Yntiso and graduate students of Addis Ababa University. KAWASE Itsushi (enrolled in FY2001); September 26, 2003 - August 31, 2004; Ethiopia FS; 21st Century COE Program; "Musical-Anthropological Study Surrounding Ethiopian Azmari and Lalibälocc Minstrels"
ITO Yoshimasa; July 2004 - April 2005; Ethiopia FS; 21st Century COE Program; "Ethno-botanic Study on the use of Forest Resources in the chira, Western Ethiopia"
NISHI Makoto; September 3, 2004 - January 31, 2005; Ethiopia FS; 21st Century COE Program; "Community and Publicness Formulated by Traditional Organizational Activities in Ethiopia"
Belle Asante; June 14 - December 14, 2004; Ethiopia FS; non-21COE Program; "Traditional Basketry as Cultural Praxis: A Case from Harar, Ethiopia"
YAMAMOTO Yudai; November 5, 2004 - April 2, 2005; Ethiopia FS; 21st Century COE Program; "People's Activities Surrounding Chat, a Non-Essential Food Crop: Its Production, Distribution and Consumption in Sidama, Southern Ethiopia"
SATO Yasuaki; November 5, 2004 - October 30, 2005; Ethiopia FS and Kenya FS; 21st Century COE Program; "Ethno-Botanical Study of Bananas: Cultivation, Use and Classification in the Buganda Region of Central Uganda: Regional Comparison with Enset in Ethiopia"
KANEKO Morie; November 4 - 29, 2004; Ethiopia FS; non-21COE program; "Research Aid for the Area Study on the Environmental Preservation Functions of African-style Livelihood Systems"
SHIGETA Masayoshi took part in the 9th International Congress of Ethnobiology held in collaboration with the 45th Annual Meeting of the Society for Economic Botany and the 8th International Congress of Ethnopharmacology held at the University of Kent, England, June 13-17, 2004 along with an ASAFAS graduate student (SATO Yasuaki), where he made a presentation on research achievements related to the EFS activities of the 21st Century COE Program (financed by a non-COE program). 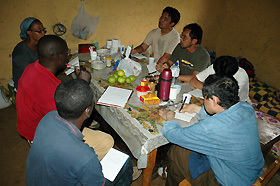 On November 4 - 29, 2004, SHIGETA Masayoshi conducted on-site education in Ethiopia for NISHI Makoto , ITO Yoshimasa, Belle Asante, YAMAMOTO Yudai, SATO Yasuaki and KANEKO Morie. EFS has rented private lodging facilities since July 2003 to be used as a base for education and research activities. Further, a substation was established in Metsa Village in the South Omo Zone in the Southern Nations, Nationalities, and Peoples Region, to serve as a center for ASAFAS graduate students conducting research activities in the neighboring area. EFS and the substation have organized seminars and joint workshops as needed. At EFS, a system has been developed and improved to facilitate contacts by e-mail as needed with the substation, Kyoto, and the dispatched students in the field, using a R-BGAN satellite communication system. Maintenance was carried out for the research equipment at Addis Ababa FS and the South Omo substation. Maintenance was carried out for the furniture and fixtures in the South Omo substation. Security measures were introduced at the Addis Ababa FS and South Omo substation for times when researchers are absent.